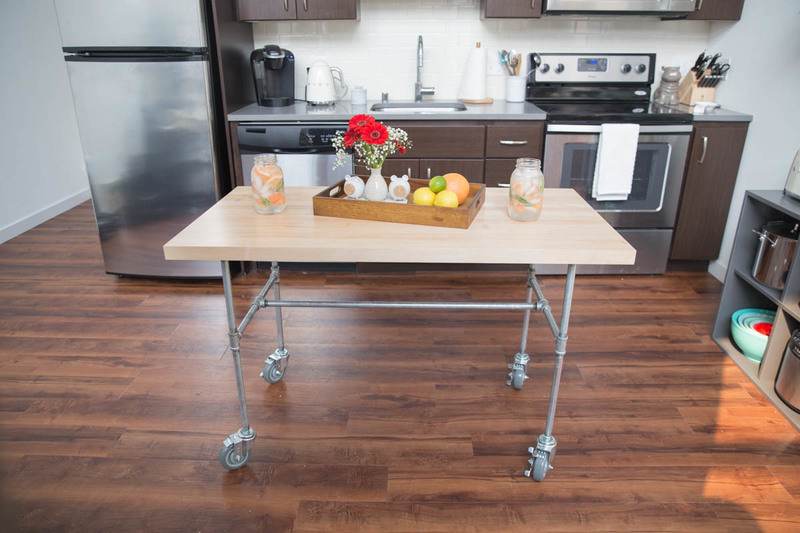 "This kitchen island has been a lifesaver!" Today’s project is a kitchen island on wheels, which I designed to be multi-functional and small enough to fit in my tiny kitchen. 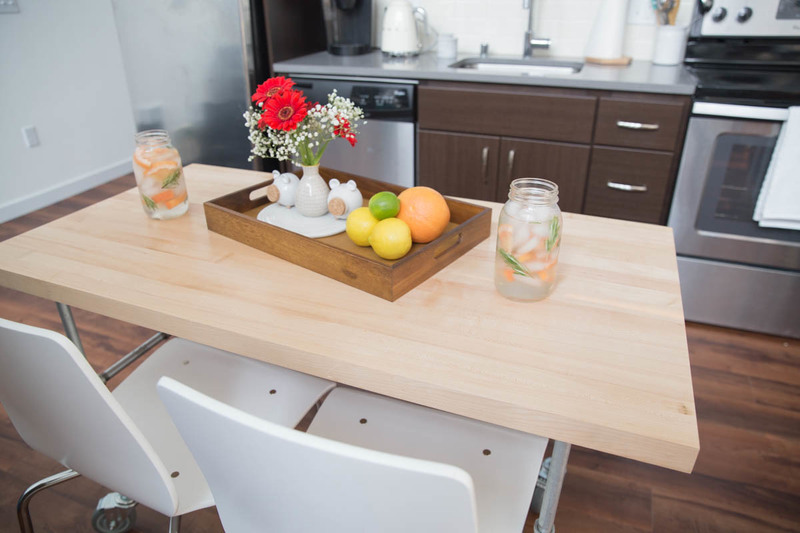 First and foremost, it serves as a table to sit at and enjoy meals. Second, it has a butcher block top, which makes it the perfect surface for prepping meals if I need some extra counter space. And because it’s on wheels, it can easily be rolled out of the way if more floor space is needed. 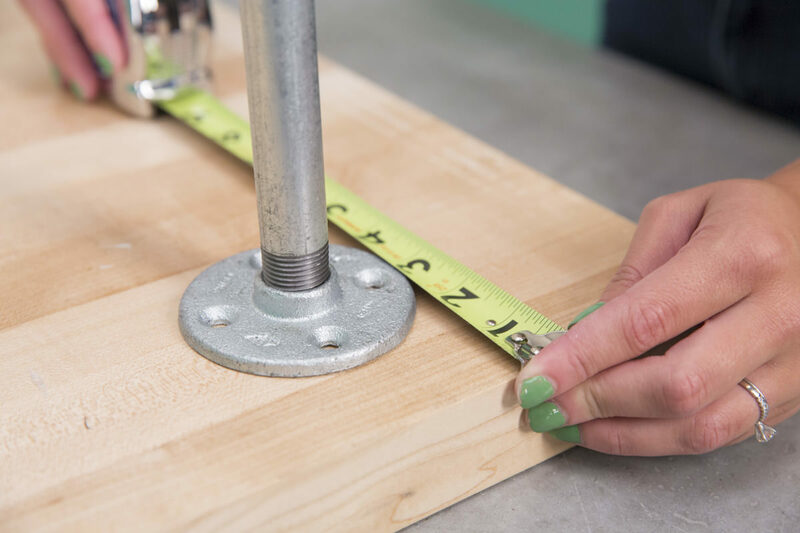 I really love the look of butcher block, and I love the idea that you can order a custom length at your local Dunn Lumber and have a island top pre-finished and ready to go (keep in mind that this butcher block comes at a standard 25" countertop width). 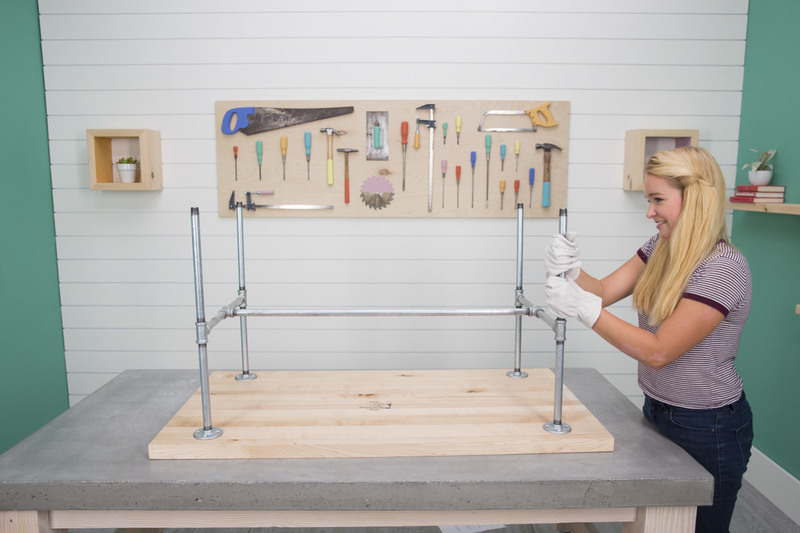 The gas pipe legs were chosen to make this project a simple one that could be thrown together in 30 minutes or less. For the legs of the island, I used steel gas pipes. 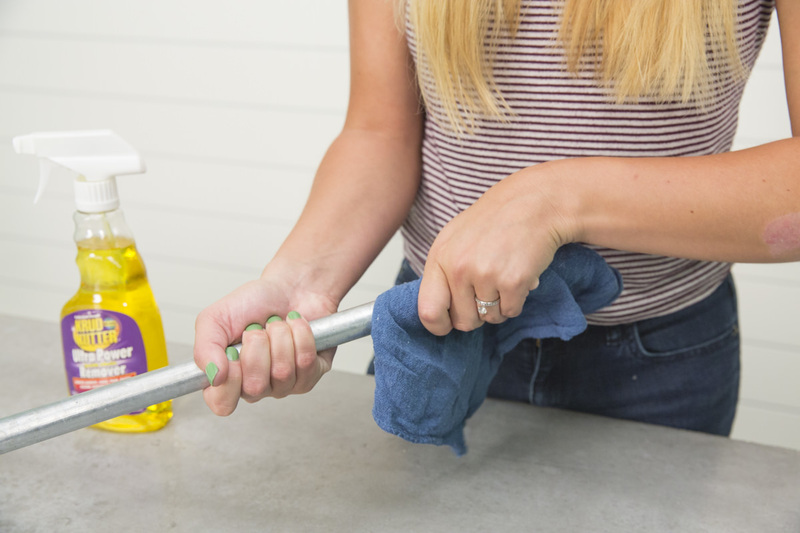 Start with an all-purpose cleaner to wipe them down, before removing any stickers and residue using an adhesive remover like Krud Kutter or lighter fluid. 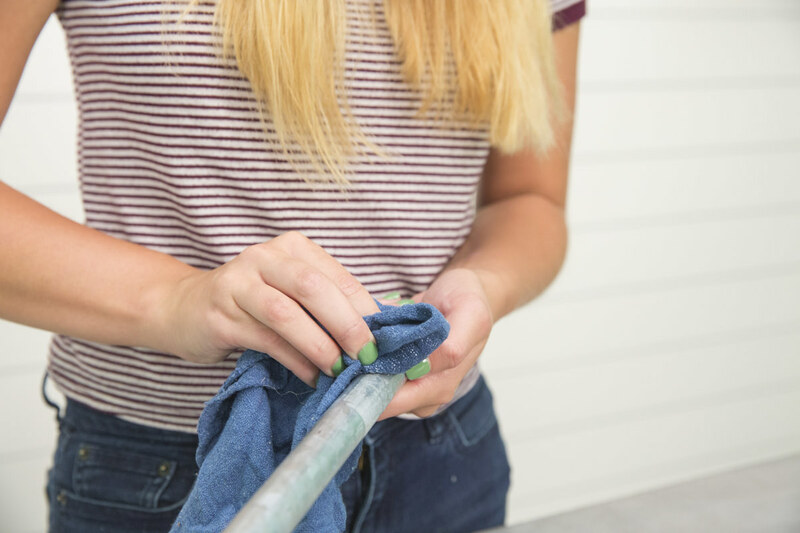 You can also use black-coated gas pipes, but if you do, you’ll need to spend a lot more time cleaning them—they’re pretty filthy straight off the shelf. 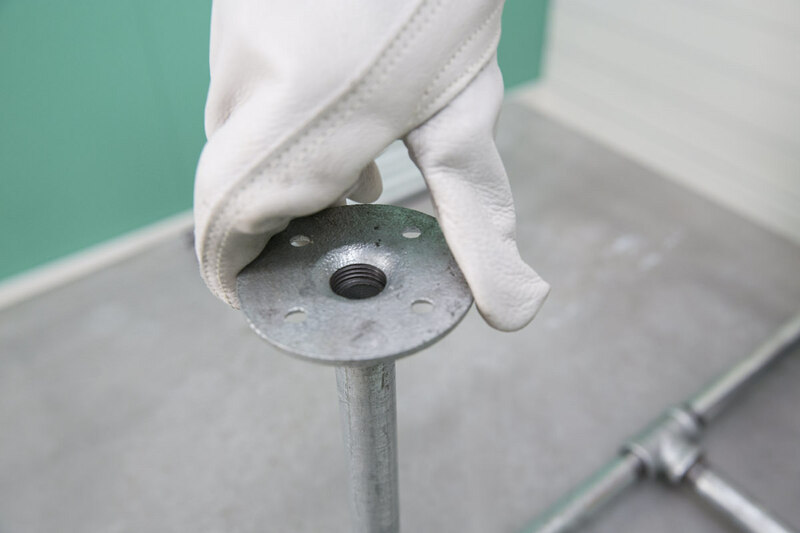 We learned this the hard way when building our gas pipe shelving unit several years ago. 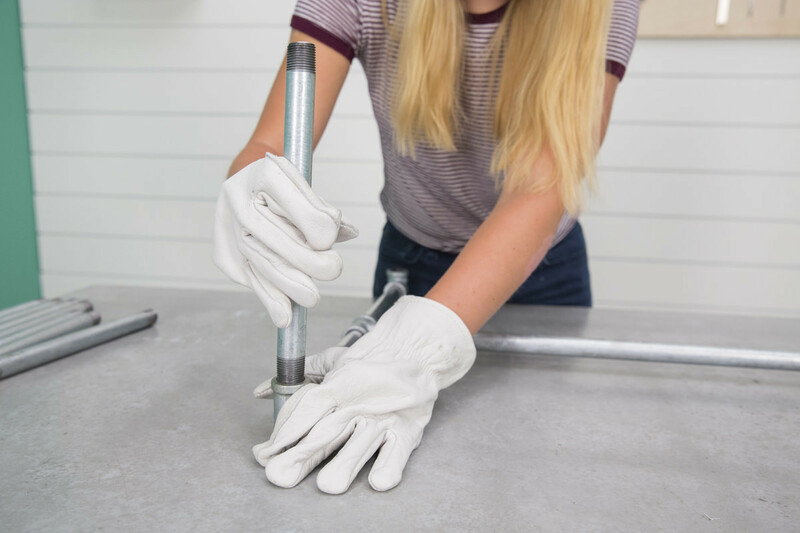 First grab a pair of gloves, because this process is so much easier with a little extra grip! Begin by attaching two 8” pipes to either end of one of the tees. 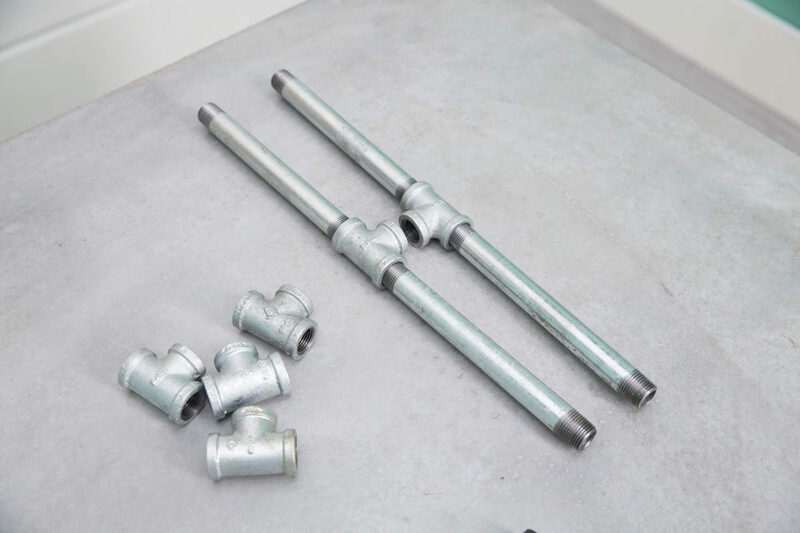 Then attach the center arm of two other tees to the ends of the 8” pipes. This is creating the horizontal cross part in the "H" of the legs. Repeat step with the other two 8" pipes and the remaining tees. Lay out the middle section so that everything is flat and the tees on the ends of the 8” pipes are vertical. 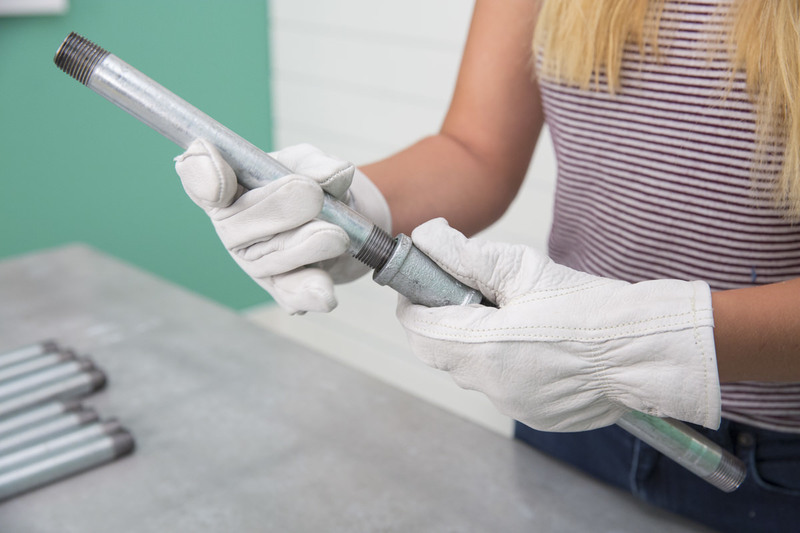 This may require tightening or loosening pieces. Now screw a 10” pipe into the top of each of the four tees. 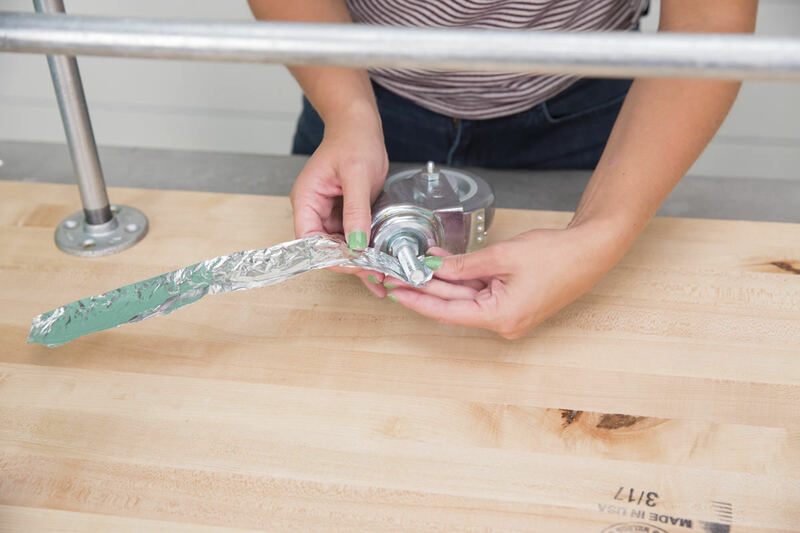 Attach flanges to the tops of the 10” pipes. This is where the legs secure to the island. Position the legs flange-side down on the bottom of the butcher block. Manipulate the pipes until there’s an equal distance between each flange and the edge of the island. Mark with a pencil. 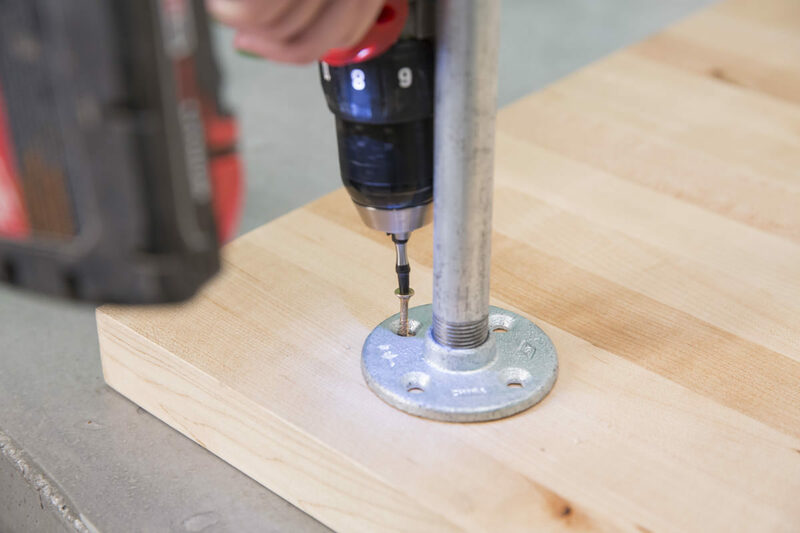 Using a power drill/driver, secure each flange to the island with 1 ½” screws. The butcher block is made of maple, which is a pretty tough wood. 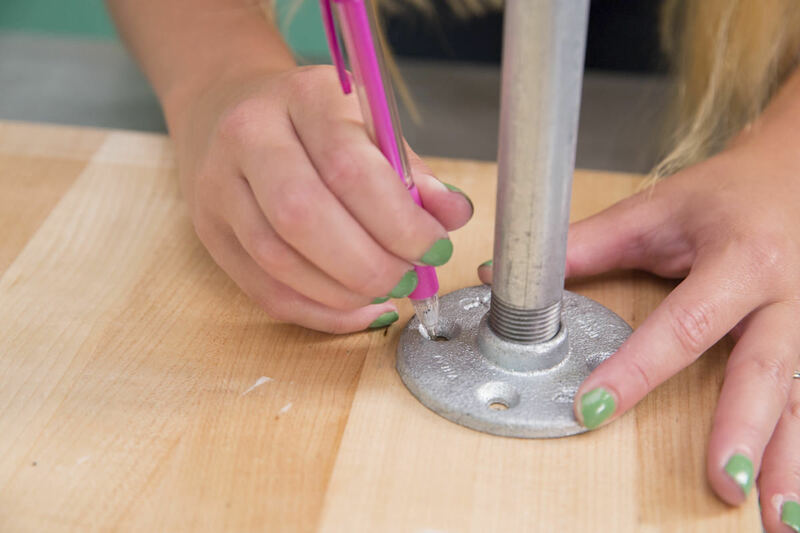 I didn’t find it necessary to pre-drill the screw holes, but if you prefer to pre-drill—you’ll find the screws go in a bit easier (while virtually eliminating the chance for splitting). Secure the 12” pipes to the four tees to make the bottom half of the legs. Dunn Lumber carries casters, but I was after a particular kind—so I picked mine up from Service Caster Corporation. Fit the wheels into the bottom of each leg. 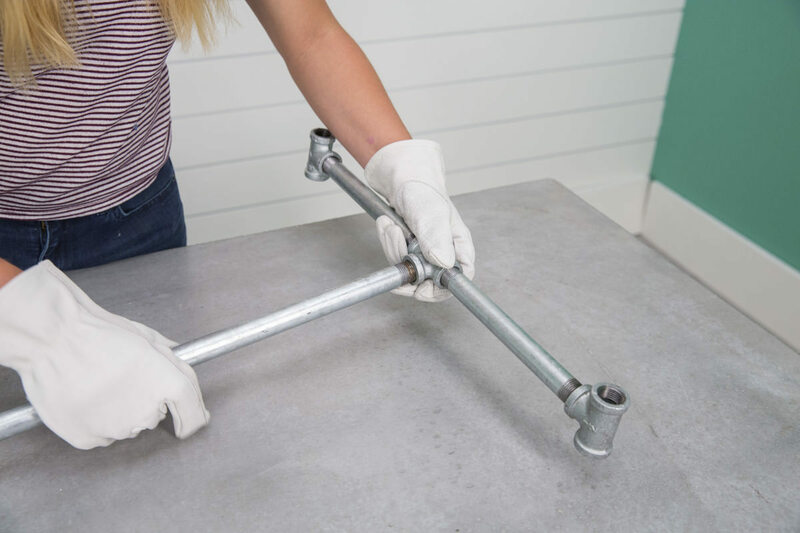 Some wheels come with an expandable shaft or can be purchased with a plastic socket to help fit into the bottom of the pipe snugly. We went the cheap-and-easy DIY route and used a little bit of foil wrapped around the top of each caster—this helps to tighten the fit. 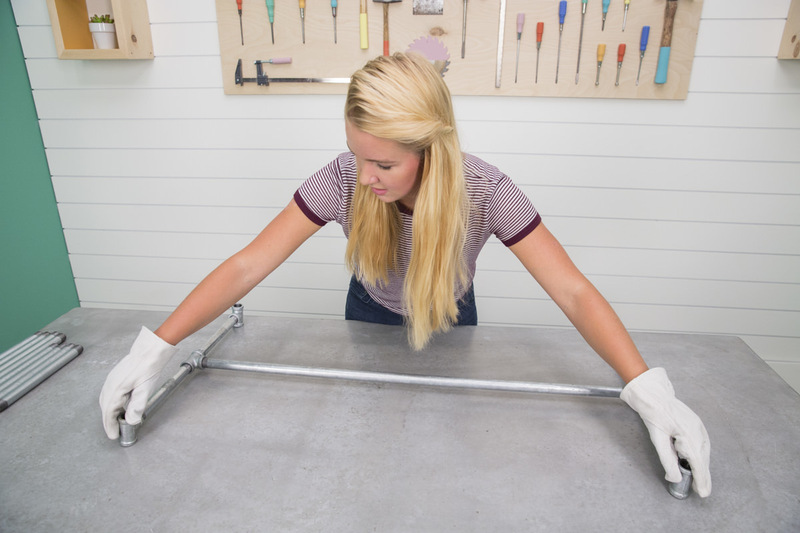 We also used a metal-specific glue to finish it out, which worked really well. Now flip the island over. The great thing about ordering butcher block is that it comes prefinished and with directions on how to take care of it. 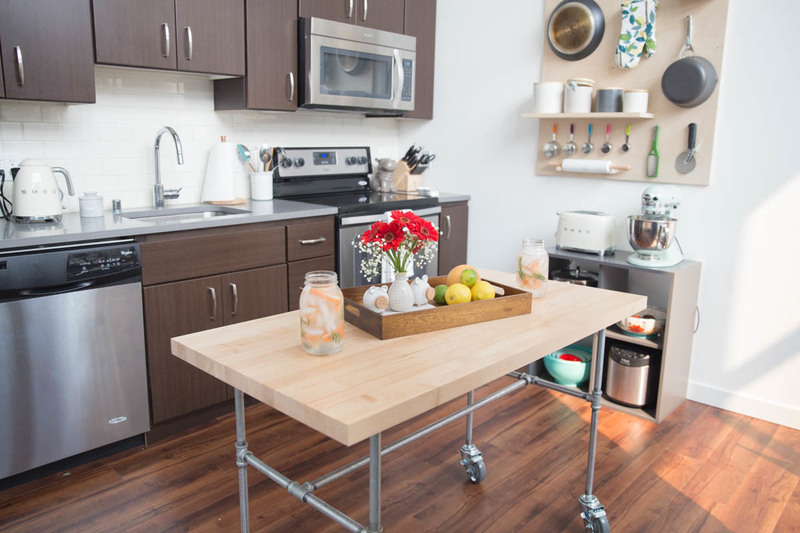 Butcher block is so versatile—you can use it like a cutting board (knowing you’ll need to refinish it eventually), or you can use it as an island and never need to touch it again. 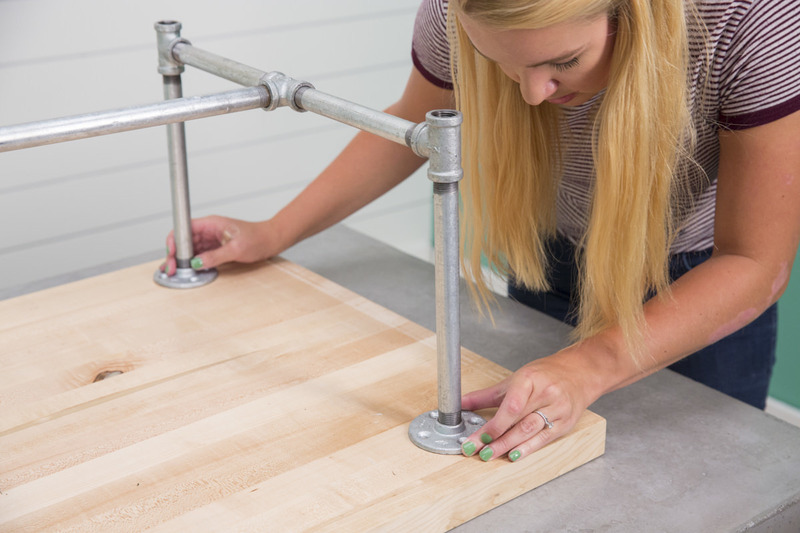 This kitchen island has been a lifesaver! We have absolutely no counter space at our apartment, and this island pulls double duty while I’m cooking. I even used it to roll out pizza dough the other night, and it worked perfectly! 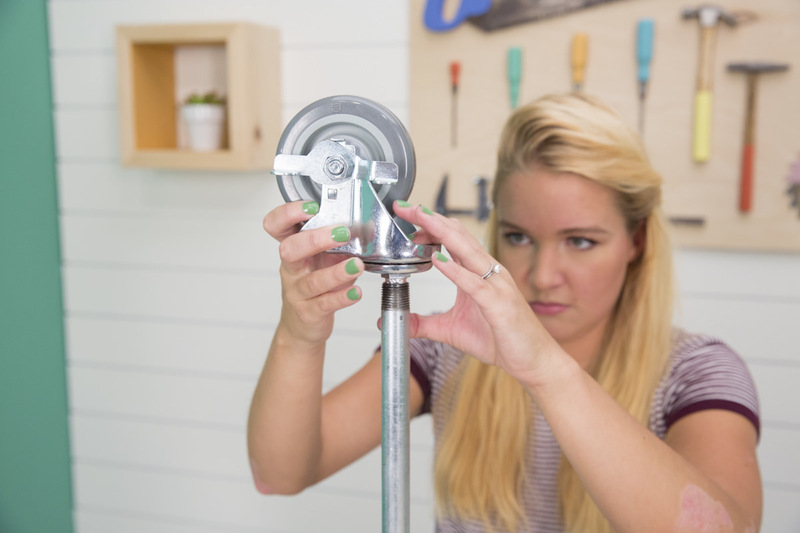 On Dunn DIY you will hear us talk a lot about miter saws and chop saws. Often they seem interchangeable, and you may wonder if there’s a difference and what it is. We're celebrating the fourth anniversary of Dunn DIY with this great summertime project: a sturdy and attractive hammock stand. It's summer and the kids are home from school. 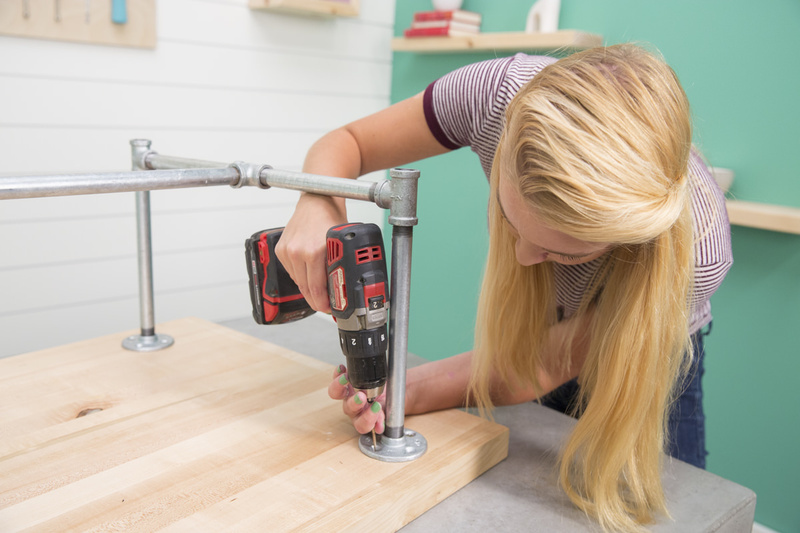 Help pass the long days with Dunn DIY Kids' projects. This flower box is cheap, simple, and accessible—a perfect summertime activity for kids and adults alike!